I think I’ve mentioned this before, but I haven’t had much success with making homemade pie crusts. I know I need more practice, and just don’t seem to have the time. Which is why this quiche appeals to me, because I can use frozen pie crusts in it. If you are a good pie crust-maker, then you could use your own homemade crusts. I also like this quiche because it has bacon, green onions and mushrooms in it. I take the easy route and use a pouch of real bacon pieces, but you can always fry your own bacon and crumble it. Or, if you’re not a meat-eater, you can leave out the bacon and add in some chopped tomatoes. So you can make this quiche the real easy way or make it a little more homemade, depending on how much time you have. Another great thing about this recipe is that it makes two quiches (you can halve the recipe if you just want to make one). Perfect for breakfast or brunch! Position your oven rack in the center of the oven, and preheat oven to 375˚F. Remove the pie crusts from the freezer and let thaw for about 5 minutes. Prick the bottom and sides of the crusts with a fork to help prevent bubbles from forming in the crust as it bakes, and bake for 8 minutes. Remove pie crusts from oven–there may be some bubbles in the crusts, so just gently pat the bubbles down. After removing crusts from the oven, reduce heat to 350˚F. In large bowl, combine the bacon, green onions, mushrooms, and cheeses; mix together and set aside. In medium bowl, whisk together eggs, Half & Half, sour cream, salt and pepper, and flour. Add this mixture to ingredients in large bowl, and mix well. Then distribute mixture evenly between the two pie crust shells, put in the 350-degree oven and bake for 45 minutes or until set (I like to put the pie crusts on a large rimmed 13×18 baking pan while the quiches are baking–it’s easier to put them in and take them out that way). Also, you can cover the quiches with foil the last 10 minutes of baking if your crusts are getting too browned. Note: The egg filling will be a little puffed up when you take it out of the oven, but it settles down as it’s cooling. I like making the full recipe so I have two quiches–one to eat now and one to freeze for later! Do you enjoy making quiche and do you make your own crust or use pre-made crusts? This entry was posted in Breakfast/Brunch, Food and Recipes and tagged bacon pieces, Green onion, mushrooms, quiche on July 21, 2017 by nancyc. When I make quiche, it’s usually on the weekends, because I don’t have time to make it for breakfast during the week. I suppose I could make quiche for dinner every now and then, which isn’t a bad idea! This quiche would be great for dinner because it has lots of broccoli and swiss cheese in it, so you get your veggies and protein. And if you’re not that crazy about swiss cheese you could use cheddar cheese instead. There are also mushrooms and onions in this quiche, which make it a wonderful cheesy blend of veggies! You’ll find that the quiche puffs up a little while it’s baking. When you take it out of the oven and let it cool slightly before cutting, it settles some–so don’t be alarmed when you see that it’s not as puffy as it was in the oven! 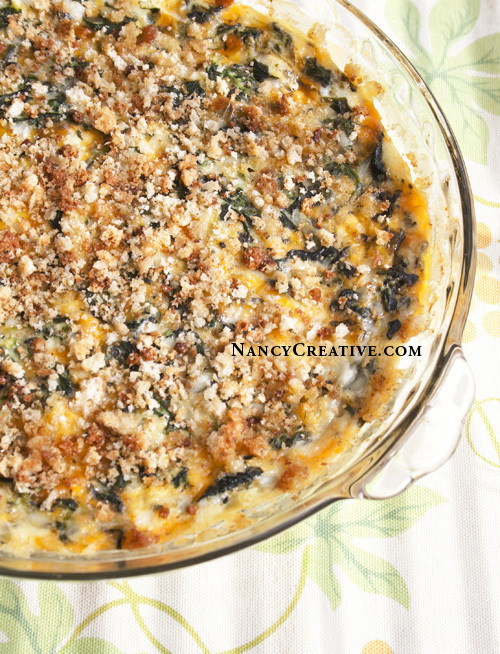 Next time you get a craving for quiche you may want to try this out! Preheat oven to 350˚F. Grease or spray a deep dish 9″ pie plate. Whisk eggs and light cream together, then add salt, garlic powder, and pepper, blending well. Add chopped onion, broccoli, mushrooms, and shredded cheese, blending mixture well. Spoon into a 9″ deep dish pie plate and bake at 350˚F for 30 minutes. Remove from oven and sprinkle with crushed croutons or bread crumbs, if using, Return to oven and bake for an additional 25 to 30 minutes, or until eggs are set and knife inserted in center comes out clean. Let quiche set for 10 minutes before cutting and serving. 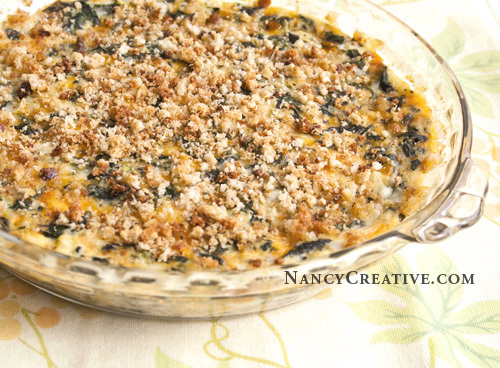 If you like the idea of crustless quiche, there’s a recipe for a really good Crustless Spinach Quiche here. What’s your favorite kind of quiche? This entry was posted in Breakfast/Brunch, Food and Recipes and tagged breakfast, Broccoli, brunch, crustless, eggs, featured, quiche, Swiss Cheese on March 4, 2014 by nancyc. One of my favorite breakfast dishes is quiche. When I make one, it’s usually on the weekend since I’m pressed for time on weekday mornings. But every so often, we have morning birthday celebrations in our department at work–and when we do, sometimes Jessica brings her wonderful Crustless Spinach Quiche! Jessica, a talented designer (you can see some of her work at JessicaWei.com), enjoys baking and makes great sugar cookies and cupcakes, too, which we’ve enjoyed at afternoon birthday celebrations. Jessica shared her quiche recipe with me and I had the chance to make it myself last weekend. It’s really easy to make and has no crust, so it’s a little lower in calories, which is nice! She found the recipe at Allrecipes.com. Sometimes Jessica substitutes kale for the spinach and she also told me you can add other vegetables (like mushrooms, sun-dried tomatoes, etc.) to the quiche mix. She uses another egg if she adds these extra veggies. So I tried this two ways–one with just the spinach and green onion; the other with 1/4 cup chopped roasted red peppers added in with the spinach and green onion. I liked it with the roasted red peppers, and I think chopped sun-dried tomatoes would be great in this, too. I did not add an extra egg since I was only adding an additional 1/4 cup to the recipe. You can experiment and add in or substitute other veggies that you like…I recommend not adding more than two extra veggies, and keeping the amount to not more than 1/3 cup each…and you’ll probably want to add an extra egg in there. Preheat oven to 325 degrees F (165 degrees C). Lightly grease a 9″ pie plate or quiche pan. Place thawed spinach in a small saucepan. Cook over medium heat, stirring occasionally until soft. Remove from heat and drain off any remaining liquid. Stir in green onions, other veggies if using (optional), eggs, cottage cheese, and Cheddar cheese. Pour mixture into prepared pan. Bake uncovered in preheated oven for 30 minutes. Remove from oven and sprinkle with crushed croutons (or bread crumbs). Return to oven and bake for an additional 25 to 30 minutes, or until eggs are set (if you are adding extra veggies and an egg, your baking time may be a little longer). Do you like having quiche for breakfast? What’s your favorite kind? This entry was posted in Breakfast/Brunch, Food and Recipes and tagged cheddar cheese, eggs, Everyday, green onions, quiche, spinach on July 19, 2012 by nancyc. 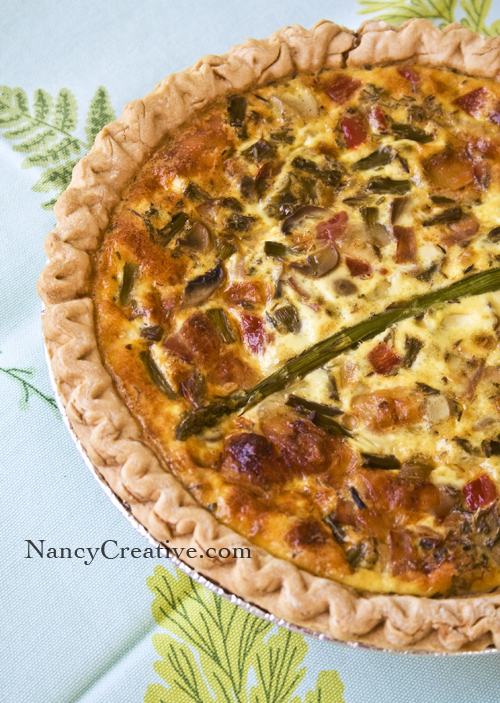 Quiche is one of my favorite breakfast foods and asparagus is one of my favorite vegetables. 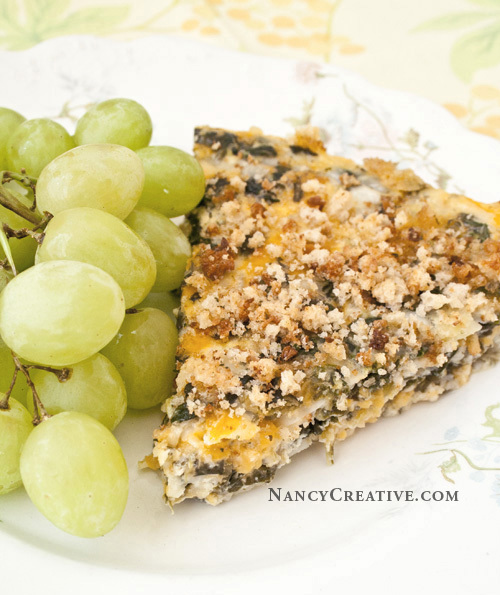 So of course I had to try this quiche recipe when I saw it at Miz Helen’s Country Cottage! To save time, I was going to use a frozen unbaked pie shell instead of making my own crust. As I started preparing the ingredients, it just didn’t seem like everything would fit in just one pie shell, so I changed the recipe slightly and ended up with two delicious quiches! In addition to ham and asparagus, the quiche also has red bell pepper, mushrooms, and green onions, so it’s filled with lots of delicious veggies. If you don’t like ham, you could substitute chicken or turkey. Or if you’re not a meat-eater, you could increase the amounts of the veggie ingredients to make up for the ham and it would still be delicious. This is a great breakfast or brunch item you can serve any time of the year…and it goes great with Kiwi-Cantaloupe Fruit Salad! Prepare your favorite pie crust or use unbaked frozen pie crusts, thawed for about 5 minutes. Bake crusts at 350 degrees for 5 minutes, just until they begin to turn brown. Remove from oven and let cool completely. In a hot skillet, melt 2 Tablespoons butter and add the chopped asparagus, red bell pepper, mushrooms, green onions, and 1/2 teaspoon salt. Saute the mix until the onions begin to turn translucent. Remove from heat, set aside, and let cool. In a large bowl, beat 7 eggs at room temperature with 2 cups half & half. Add 1/2 teaspoon salt, 1/4 teaspoon pepper, parsley, and thyme; mix well. Add 2 cups of the Swiss cheese, the chopped ham, and the sautéed vegetables, and blend, distributing the ingredients evenly in egg mixture. With the remaining cup of shredded Swiss cheese, sprinkle 1/2 cup over the bottom of each lightly browned pie crust. Pour the egg, ham and vegetable mixture into the pie crusts, dividing mixture evenly between the two. Place whole asparagus on top for garnish, if desired. Bake at 350 degrees for 1 hour. Cool completely before serving. Linked to Strut Your Stuff, Show Off Your Stuff, Taking Time Out Thursday. This entry was posted in Breakfast/Brunch, Food and Recipes and tagged Asparagus, Bell pepper, breakfast, Everyday, Onion, quiche, Swiss Cheese on October 15, 2011 by nancyc.